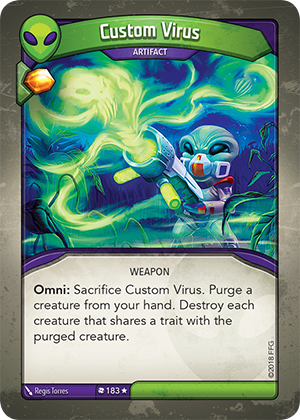 Card Text Omni: Sacrifice Custom Virus. Purge a creature from your hand. Destroy each creature that shares a trait with the purged creature. If I purge a creature from my hand with a “Destroyed:” ability, does that ability trigger? No. Cards can only be destroyed from play, not out-of-play areas (such as a hand, deck, archives, or discard pile). Also, “purge” and “destroy” are completely different methods of card removal. Therefore, “Destroyed:” abilities do not trigger when a creature is purged by Custom Virus.